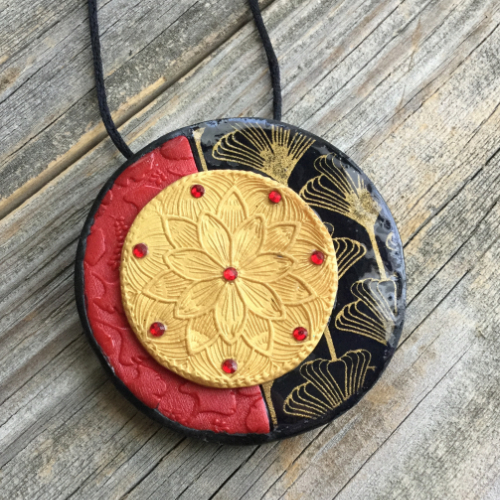 The traditional colors and imagery associated with Asian design influenced the creation of this polymer clay pendant. Roll black clay to a little less than 1/4” thick. Silkscreen with gold paint and Ginkgo silkscreen. Let paint dry. 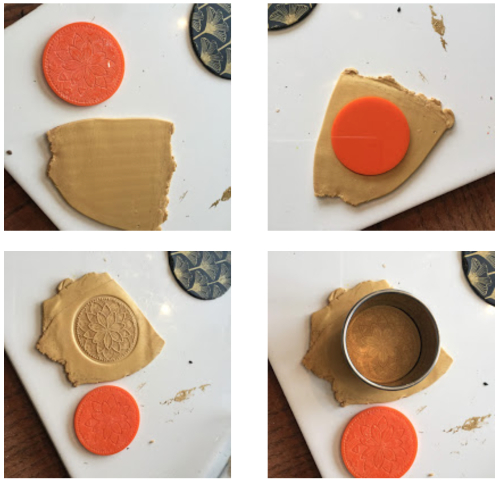 Use circle cutter to cut disc from silkscreened clay. Roll gold clay to a little less than 1/4” thick. Dust Deco Disc with cornstarch, tap to remove excess. 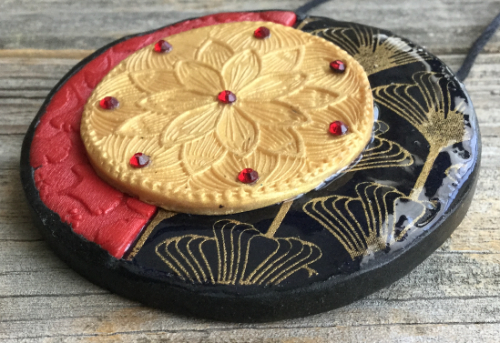 Stamp rolled clay with Deco Disc. 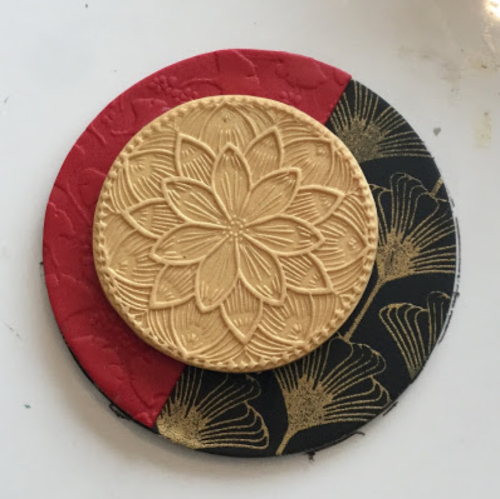 Use round clay cutter to cut out stamped Lotus flower. Roll red clay to a little less than 1/4” thick. 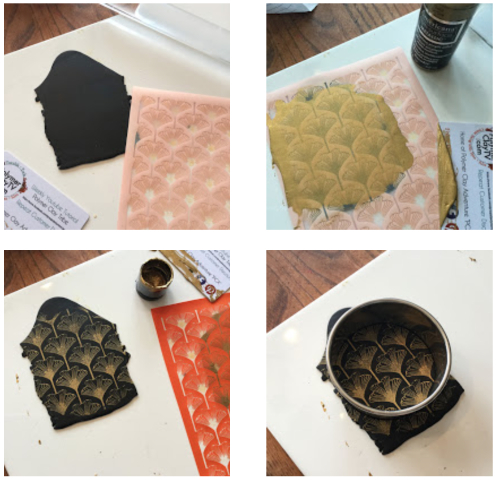 Use Ginkgo texture sheet to texture rolled clay. Apply Bake & Bond and mount lotus flower centered over edge of red clay – off center on pendant as shown. 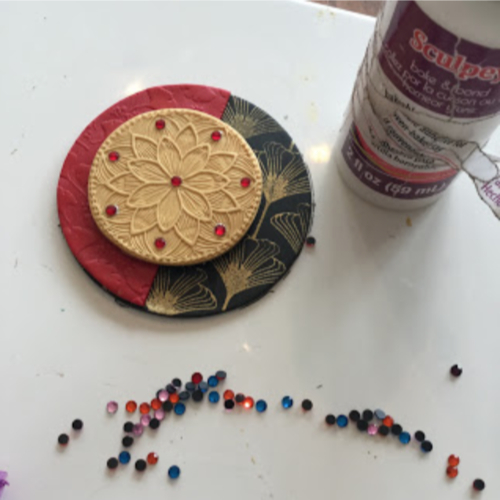 Use Bake & Bond to apply red gemstones to lotus flower as desired. For finishing the pendant, I tried it two ways. For the first, I applied Gel du Soleil UV resin over the entire pendant and cured. It has a great glossy shine all over and catches the light beautifully. For the second pendant, I covered the black silkscreened portion of the pendant with scrap paper, sprayed the remainder of the pendant (front and back) with PYM II sealant. Then I applied the Gel du Soleil UV resin just to the black silkscreened portion. I love the finished result – the black looks lacquered but the texture and details of the other elements is better highlighted.